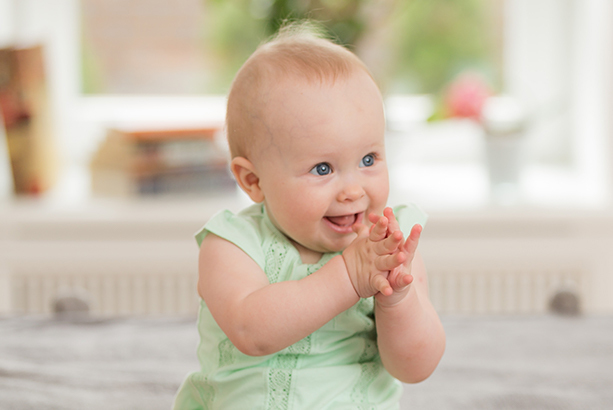 Between 6 to 9 months, babies enjoy much better control over their hands, and they become a nonstop flurry of activity. Babies can now hold two objects, one in each hand, bang them together, and bring them to the mouth for further exploration. She can press large buttons, pull and strike objects. By the end of the ninth month, babies can move their fingers separately from the palms, which triggers immense improvement in grasping; babies can now gets so more out of playing and exploring her toys. A s babies learn to gauge distance, they confidently reach out to grasp objects, bringing them into their mouth while continuing to explore them with the fingers. 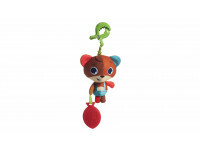 Coordination between the hands is much more polished now, so babies can pass a toy from one hand to another, holds two objects, one in each hand, and bang them together. Towards the end of the seventh month or sometime during the eighth month, babies can separate her fingers, which enables them to hold objects more securely in the “glove grasp” – with fingers on one side and the thumb on the other. In the eighth or ninth month, babies begins to move their fingers independently, and now adopt the “pincer grasp”, using the index finger and thumb to pick up small objects. Over time, babies learn that they can voluntarily release objects from their hands, and discover the ability to choose what to pick up and how to take hold of it. Can gauge distance well enough to reach for and grasp desired objects and bring them to his mouth. Most babies begin to separate their fingers and use them to grasp or move something. Begins to release objects voluntarily. Control over the jaws, lips, tongue and palate improves significantly in preparation for the tasks that lies ahead: chewing solid food and speaking. 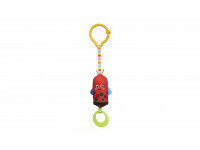 Offer a variety of toys, of different textures, shapes and sizes to your baby. This stimulates feelings in the palm of his hands, and helps him practice various ways of grasping. Offer a well-designed activity center that has a wide variety of activities to motivate your baby to use different skills, like pushing, pulling and striking. Allow your baby to explore objects with his mouth to sharpen the senses in this area and exercise these important muscles.